True and lasting peace is rare in our sin-ravaged world. Fear, sin, uncertainty, doubt, and many other forces war within us. The holidays don’t invoke good memories and/or warm fuzzy feelings for many people. Just a quick read through the newspaper can leave one’s mind and heart reeling in a state of unrest. While most of us manage to grasp pieces of peace here and there, what is the secret to the few who find a confident assurance that everything is going to be okay, even in the midst of adversity? 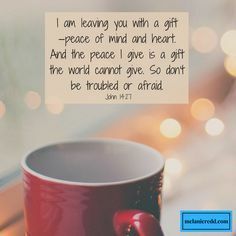 Jesus says He will give us peace if we are willing to accept it from Him. Unlike worldly peace, which is usually defined as the absence of conflict, the Holy Spirit’s work in our lives produces deep and lasting peace. With Christ’s peace, we have no need to fear the present or the future. Beginning a new series on peace, Pastor Cliff Purcell shares some practical ways to secure deep and lasting peace. His first podcast can be found here: “Making Peace With God” (Dec. 2, 2018). The next podcast can be accessed here: “Making Peace With My Past” (Dec. 9, 2018). Wishing you God’s gift of His deep and lasting peace! This entry was tagged "I am leaving you a gift - peace of mind and heart (John 14:27), Christianity, how can I find a deep and lasting peace?, how can I find peace with God?, how can I find peace with my past?, how can I not be anxious about the present or future?, how is God's peace different than worldly peace?, More Than Pieces of Peace, Pastor Cliff Purcell: Making Peace With God, Pastor Cliff Purcell: Making Peace With My Past, what does the Holy Spirit do?, when the holidays are not peaceful. Bookmark the permalink.